As a busy mum of two, I very rarely get time to think, never mind give myself a pamper. I'm always on the go so when I was offered the chance to try out a pair of moisturising gel slippers from Simply Feet, I was so grateful. The slippers are available in cow and leopard print. 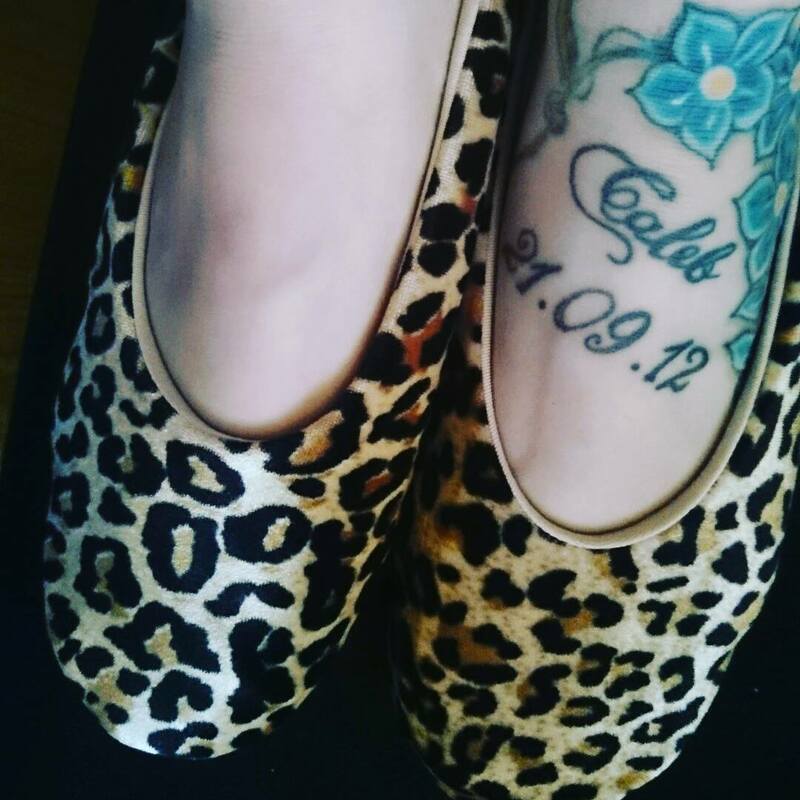 I love leopard print so that was an easy decision! The slippers look just like regular slippers with the exception of the lining inside. The inside of the slippers feel, as the name suggests, like gel. This gel is infused with seven natural botanical and essential oils; avocado, olive, mineral, jojoba, grape seed, canola and soybean oils, and they are enriched with aloe vera, green tea and willow fragrance. When I first opened them I gave them the sniff test and I really liked how they didn't have a chemical scent but were rather floral and feminine. I followed the instructions to a T: wash feet thoroughly (I'd wear them after I'd had a shower), put them on gently and wear them 2-3 times a week for 20-30 minutes. After the first use, my skin felt smoother and softer straight away and even the fragrance transferred. They are a little tight to get on due to the gel. I chose the Medium slipper which suits foot sizes 5-6.5 as I am a 6 but they were still very comfortable. Cleaning them is easy, you just need to turn them inside out and wipe with a cloth. I've used them around 16 times and the gel still works as well now as it did in the beginning. 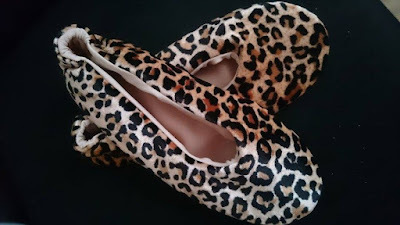 I would definitely recommend these slippers to anyone and I think they'd make a wonderful Christmas gift. 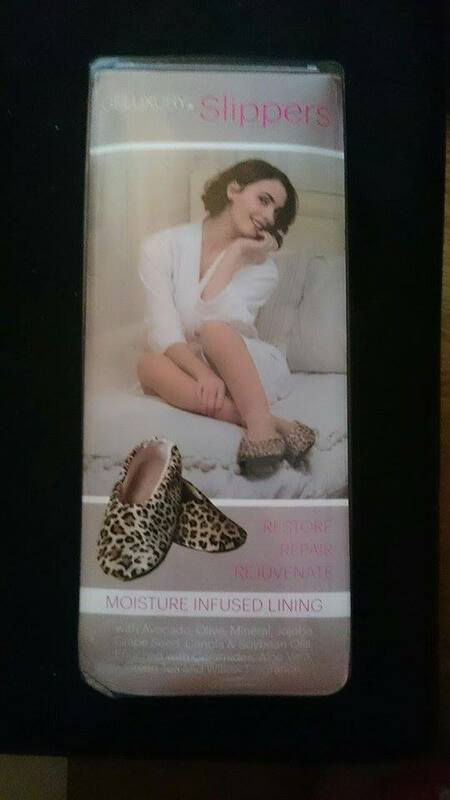 The Geluxury Moisture Replenishing Slippers are available in sizes Small to Extra Large (2.5-10.5) and you can choose between leopard or cow print. They retail at £30.00 and you can purchase them from Simply Feet. 1 comment on "Geluxury Moisture Replenishing Slippers - Review"
These look so cool! Did they feel weird to wear? Like wearing those gel insole things? I love the print. Also, I love your tattoo!